Part of Logan’s Air Force JAG appointment is that he spends a month at Field Training this summer. He’ll be pushed physically and mentally in preparation for his future role as an officer. In anticipation of a month of alternating cafeteria style food and ration packs, we wanted to get some delicious meals in the weeks leading up to him leaving! So last weekend I surprised him with a trip to one of his favorite Durham places, Dame’s Chicken & Waffles. Dame’s is an amazing place. I know this makes me a bad southerner, but the idea of chicken and waffles didn’t really make sense to me. 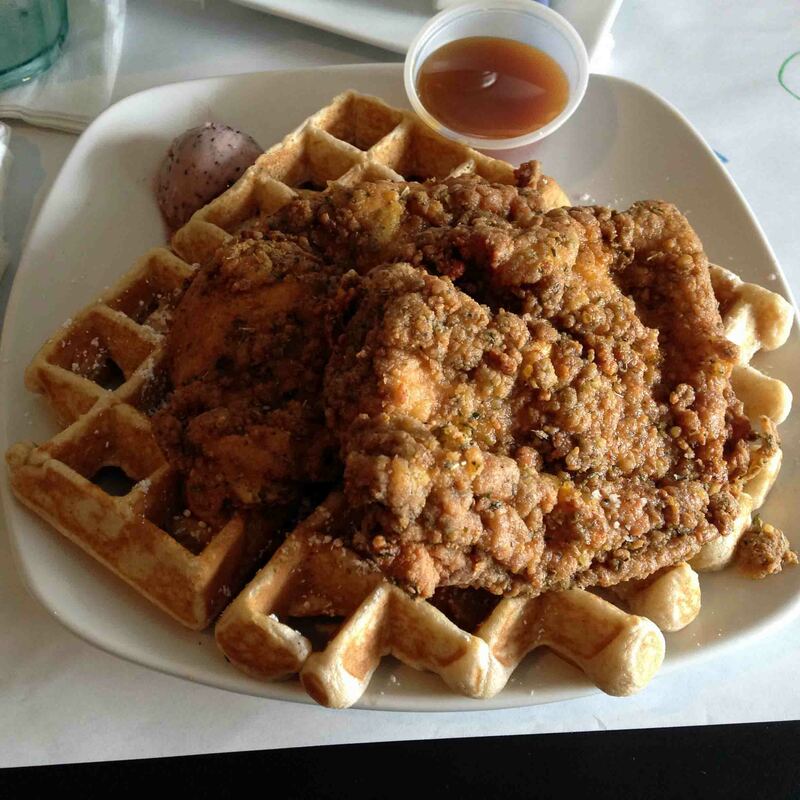 Two things I really love, but the sweet decadence of a waffle with some crispy juicy fried chicken didn’t make sense on the same plate. It felt like a weird concept. But after our first visit to Dame’s, I learned my lesson! Somehow it’s amazing together – the two flavors give you both sweet and savory in the same bite, and the result is perfection. Dame’s menu has lots of suggested combinations, but you can substitute anything that doesn’t suit or make your own combo even down to whatever shmears or drizzles you want on it. That’s another thing: they have these amazing whipped butters they call shmears. They’re sweetened and flavored, and I haven’t had a bad one yet. 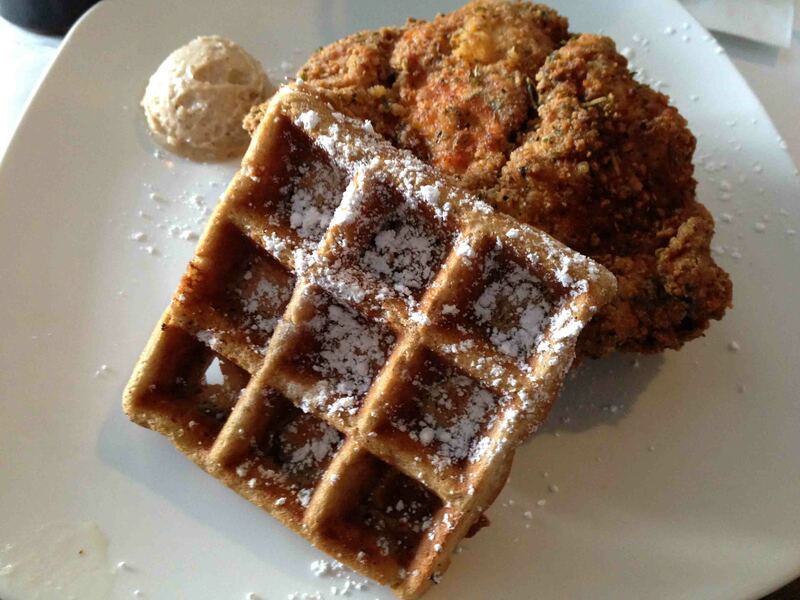 This trip I chose the Quilted Buttercup: half of a sweet potato waffle, fried chicken cutlet, and maple-pecan shmear. 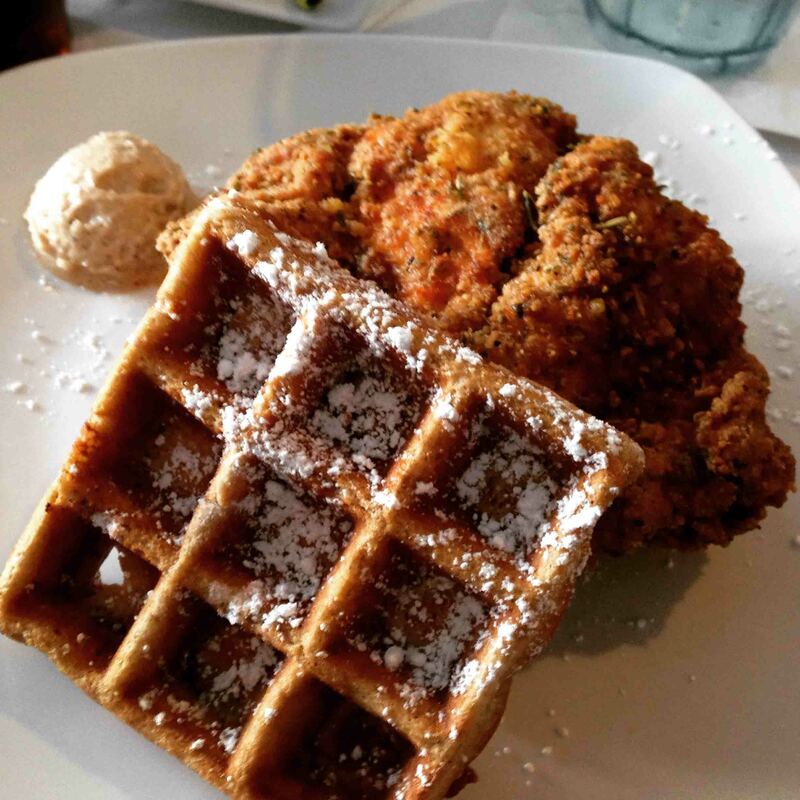 I think I’ve gotten the sweet potato waffle every time – it’s so tasty that I haven’t been able to not order it. Logan got the Buff Brahmas, but he customized it to get a blueberry waffle, two cutlets, blueberry shmear and a whiskey creme sauce drizzled over the whole thing. Homeboy loves him some blueberries. Plus this comes with a side, and we both got mac and cheese of course. It seems almost unnecessary to say that it was freaking delicious. It was so. so. so. good! I can’t even think of how to describe it. The fried chicken has this great spice mix in the breading, and it adds a complexity of flavor that makes it addictive. I have a hunch the same spice mix is used in the mac and cheese too. The waffle doesn’t taste overly sweet, but the shmear (and syrup, if you want it) means you can control the sweetness. I’m not usually a fan of nuts, but the waitress recommended the maple-pecan shmear with my meal and I thought it was perfect. Here’s the thing about Dame’s food: if you play your cards right, this can be the only thing you eat all day. It’s SO MUCH FOOD, but it’s so irresistible that we just keep eating until it’s gone! Seriously, if we go for lunch or brunch and skipped breakfast, we can fill up at Dame’s and not need another meal. My order, the Quilted Buttercup, is technically smaller than the others (half the waffle and one cutlet instead of two), but still was enough to fill me up for the rest of the day outside of snack before bed. The building itself is pretty cool: it’s located in downtown, right on main street. 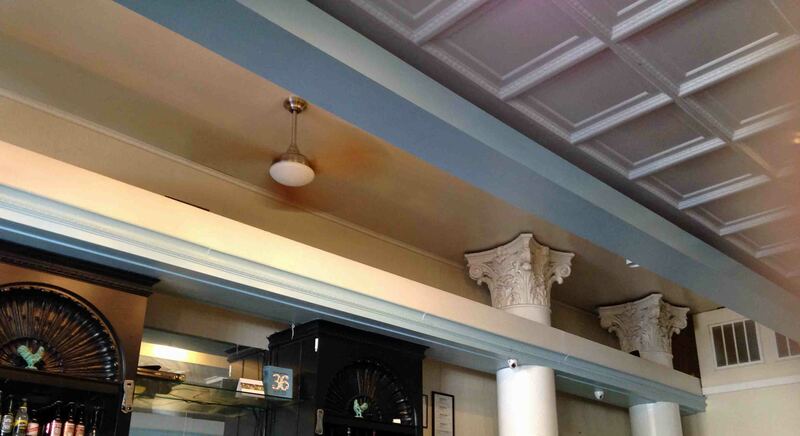 It’s got cool ornate columns and detailed ceilings reminiscent of another time. 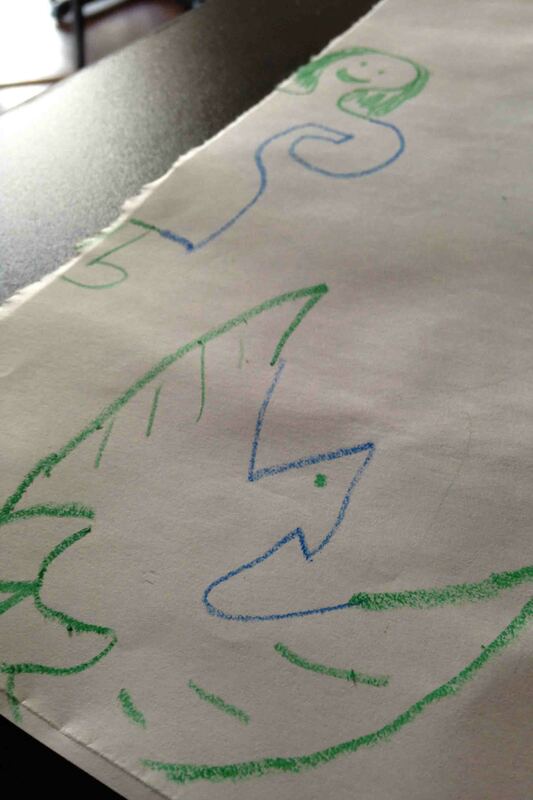 They also put paper & crayons on the tables, so you can embrace your inner child and draw all over the place. Logan and I like to play a game at restaurants like this where one of us draws a random scribble, and the other makes it into something. It’s fun and silly, and a good way to waste 20 minutes waiting for food. Two warnings for anyone headed to Dame’s. First, make a reservation. It’s a small place, and on weekends it is packed. The first time we went, we made the mistake of showing up Saturday late morning for brunch and had to wait two hours. We ended up walking around downtown while waiting for them to text us that our table was ready – it was nice that we didn’t have to sit and wait right there, but still. This place is packed on the weekends. The other warning is don’t expect the greatest service. This past visit our waitress was wonderful: friendly, offered suggestions, didn’t rush us when we wanted to check out the menu another minute. But often in my experience (and others’, not just me), the staff can be distant and/or rushing to get you fed and out of your table. The food is worth it, but don’t be surprised that happens.